There were over 50 different models in the 1953 Hamilton men's wrist watch lineup. To put it in perspective, consider there were only 20 models in the 1946 lineup. The number of unique models continued to increase once automatic and electric models were introduced. I suppose there's only so much you can do with design features; square, round or rectangular, numerals, markers or printing, etc. So I think a lot of the 1950's models can go unnoticed because they blend in with all the other models. As a result, it's always a pleasant surprise to come across a new model that I haven't seen before. My most recent example is a 1953 Windsor. It was produced for three years. The Windsor came in a 14K gold filled case and featured a sterling silver dial with solid 18K markers and squares. Think it looks familiar? 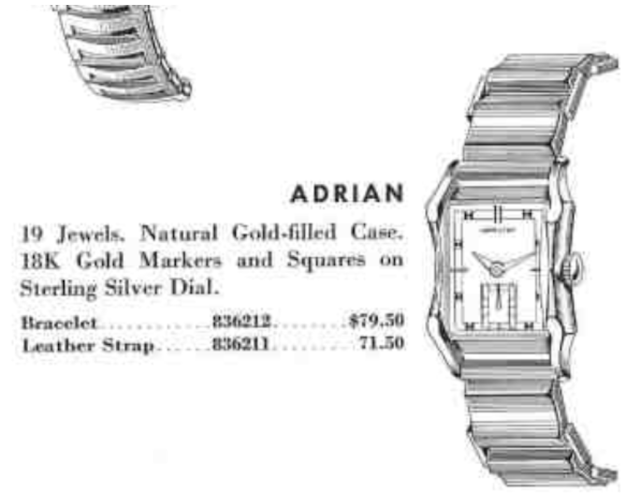 I do... check out the 1953 Adrian for a quick example. 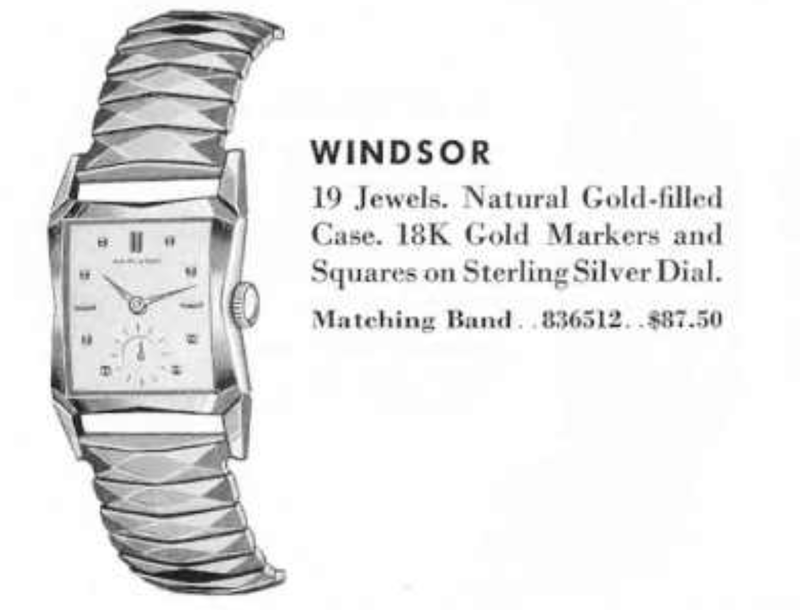 Tucked inside the Windsor is a 12/0 sized movement, most likely the 19 jewel 753 movement although a 770 wouldn't be a shock since it was introduced in 1955 and the Windsor was still in the lineup then. My project watch came courtesy of a collector who focuses mainly on pocket watches. As such, he wanted to see if I would like to buy it. All that was known about it was it wasn't running but looked to be in decent shape. It also has its original bracelet. Buying a non-running watch is always risky, there are lots of reasons why a watch doesn't work. I figured it was worth a role of the dice though and, worst case, I could just replace the movement. The bracelet on this model was made by Kestenmade. Typically bracelets were made by Kreisler or JB Champion but other brands like Gemex, Duchess, and a couple of other brands... but rarely Speidel (although there are a couple of early examples with Speidel bracelets). The cylinder style crystal is a bit scratched up so it will be replaced. The 753 movement inside has a serial number that dates to 1954, making this a 1954 Windsor. It's not running but I don't see a broken balance staff so at least that's a promising sign. The inside of the case back makes identifying the model super-easy. I'll prep a new glass crystal for installation while all the parts are in the cleaner. I could tell the movement was very gummed up when I took it apart. Some of the wheels where stuck inside their jewels. Now that it spent about 20 minutes in the ultrasonic, it's back to running nicely. Based on the timer, everything is looking good. The beat error of 2.3ms is on the high side of acceptable. It wouldn't take much of an adjustment to reduce it but that would also introduce the risk of goofing up the hairspring accidentally. This watch now looks as good as it runs and with a new crystal it looks almost factory-fresh. There's just a hint of wear to the high points of the bracelet and a slight scratch on the dial from a past hand remover, otherwise this watch would look like new old stock, don't you think? Awesome work Dan! as usual! glad you did not find too many major issues!!! Great work again Dan, guess you must be moving pretty close to the end of your Hamilton journey? You have mentioned several times that there are only a couple of models that use the Speidel braclet, which models were they....? I don't know all of them but the few models that do have Speidel bracelets are the early bracelet models like the 1949 Dewitt and maybe the Darrell.